Chrome Wall Mount Tub Faucets: All the character of vintage plumbing with maintenance-free features! Tarnish resistant chrome-plated brass construction requires little upkeep to always look gorgeous. Drip-free 1/4 turn ceramic valves save you money with no more leaky faucets. 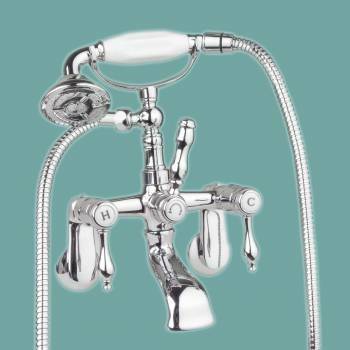 Easy grip, teardrop chrome levers, chrome lever diverter along with a handheld telephone style shower, cradle & tangle-free hose complete your vintage look! NOTE: For inside tub wall installation ONLY. Faucet measures 7 inches wide, 8 inches high, and projects 4 3/4 inches. Includes 58 inch flexible handheld shower.